What is the Card Compromise Assistance Plan? The Card Compromise Assistance Plan provides your business the highest levels of assistance available in the industry today. This site is a resource to learn more about the Card Compromise Assistance Plan which provides you peace of mind knowing your business is protected from the crippling expenses associated with a real or suspected breach. You depend on us to look after your interests in the payment processing industry while you run your business. We did the research and found the assistance you need in the event of a card data breach. The Card Compromise Assistance Plan is a new and unique indemnification program acquired to reduce monetary exposure in the event of a data compromise of a merchant account. The Card Compromise Assistance Plan is designed specifically to meet the expenses resulting from a suspected or actual breach of credit card data from a merchant account. The program is offered and administered exclusively by RGS Limited, LLC (www.royalgroupservices.com) and funded by an insurance policy purchased from a financially strong insurance organization whose insurance companies are rated "A" by independent third party rating agencies. • Mandated forensic audit expenses when a compromise is suspected. 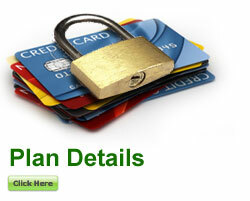 • Card replacement costs and related expenses from an actual or suspected breach. • PCI DSS assessments and fines levied by the card brands for data breaches. • Assistance with data breaches due to network hacking, skimming and physical losses resulting from employee dishonesty or third-party theft of computer or paper records, provided the business owner is not involved. The Card Compromise Assistance Plan provides your business up to $100,000 per merchant identification number and up to $1,000,000 per incident for multi-location businesses. If your business suffers a suspected or actual data breach, your business could incur thousands upon thousands of dollars of unexpected costs in the form of audit expenses, card monitoring and replacement expenses, and fines. These costs could significantly affect revenue... and even jeopardize the existence of a business. The Card Compromise Assistance Plan reduces a protected business account's monetary exposure when a presumed or actual data compromise occurs, thus providing peace of mind. What is the protection limit? The maximum protection is $100,000 per merchant identification number per incident. A cap of $1,000,000 annually is in place for businesses with multiple merchant identification numbers. Can any business qualify for this program? Any PCI Level 3 or 4 accounts are eligible, provided there has not been a data compromise. Does my business have to be PCI DSS compliant in order to be protected under the plan? No. However, if a business experiences a breach, the business must become compliant before participating in (or re-entering) the plan. How often is a small business or level 4 breached? Nearly 90 percent of all breaches occur at Level 4 businesses. In fact, Eduardo Perez, VISA USA's Vice President of Payment Systems and Risk, previously stated, "Hackers are concentrating on the smaller merchants... that's where we see the greatest vulnerability." If our point–of-sale transaction processing system does not store magnetic stripe data, can it still be compromised? Yes. While it is true that systems that store magnetic stripe data are the most vulnerable, there are a number of other risks. For example, missing or outdated security patches, using vendor supplied default settings and passwords, SQL injections by hackers, unnecessary and vulnerable services on your servers, stolen receipts, stolen computers, employee theft, and skimming can all lead to significant data compromises and subject your business to audits, card replacement costs and fines. I validated compliance with the PCI DSS. Why do I need this? Compliance with PCI DSS provides your business with a front-line defense against compromises and is required by the card brands. C-CAP provides you with assistance in the event of a breach. Small businesses have increasingly been the focus of criminals. Validation of PCI DSS compliance is not a guarantee that a breach will not occur. Also, the plan protects against employee theft and the physical theft of data. How is a data compromise reported? Contact Central Payment immediately in the event of a suspected compromise. If my business suffers a data compromise, how quickly will the claim be processed? Once the relevant documentation is provided, the requests for payments will be processed. Provided the documentation is in order, the request should be processed within thirty days. For any expenses to be paid under the Card Compromise Assistance Plan, those expenses must be assessed by the card association against the merchant as a result of an incident. A qualifying "card association" would be any one of the following entities formed to administer and promote cards: MasterCard International, Inc., VISA U.S.A., Inc., VISA International, Inc., Discover Financial Services, American Express, JCB International Credit Card Company, Ltd. or any of the following Debit Provider Networks: Exchange/Accel, Interlink, Maestro, NYCE, Plus, PrestoLink, Shazam and STAR. For hardware and software upgrade expenses to be paid under the Card Compromise Assistance Plan, the upgrades must have been ordered by a card association to avoid a PCI Assessment from being issued as the result of an incident. *The information provided in this FAQ is for general information purposes only. For the complete terms and conditions of the Card Compromise Assistance Plan please refer to the Terms & Conditions document. Disclaimer: C-CAP is offered by TSYS Merchant Solutions and RGS. FNBO is not a party to this plan and has no liability or responsibility for C-CAP. Please fill out the form below with any questions you may have regarding the protection provided under the Program. Validate that your business is protected. Print out evidence that a business is protected by entering your merchant identification number below. 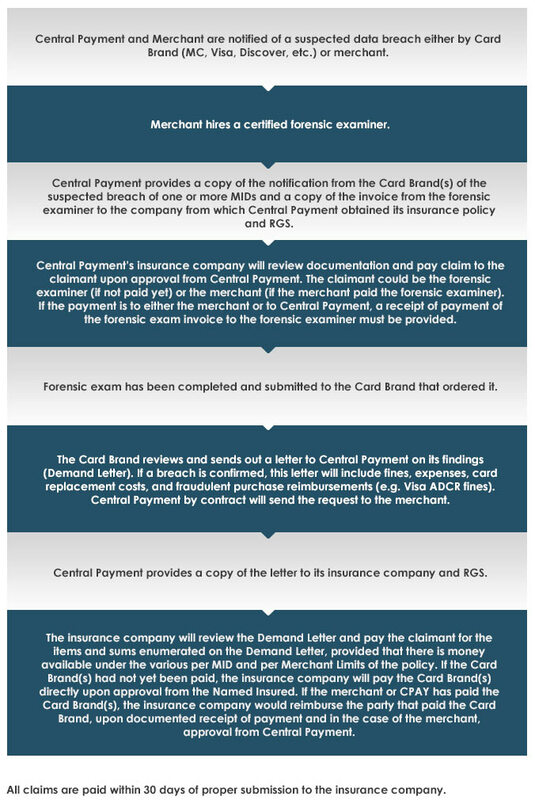 Please contact Central Payment at 800-449-8012 to begin the claims process. RGS provides insurance programs designed with a seamless approach for financial and healthcare related industries. The RGS turn-key programs effectively protect small and medium size businesses against specific risks associated with data breaches. The data breach programs, developed through our strategic partnership with A rated insurers, offer protection for losses not typically covered under business insurance policies. RGS has forged strategic partnerships with some of the most respected industry leaders, including Fortune 100 banks, community banks, payment processors, network security companies, hardware and software suppliers, insurance companies and third party service providers to the healthcare industry. In addition, RGS has an international presence through its various global partnerships.